I've decided to enact a new weekly feature I'd like to call "Web Wednesday" where we celebrate the best the internet has to offer in terms of fashion. 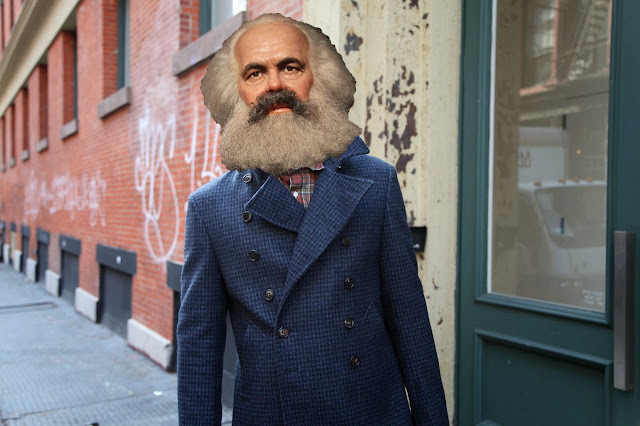 Kicking things off is the hilariously-executed #marxwear, a tumblr featuring the famous Communist theorist Karl Marx in some of today's hottest "bourgeois" fashions. The juxtaposition of left-leaning Marx (who, granted, does make a pretty good Hipster with his ironic facial hair and all) and some of his choice quotes with high-end mens fashion is original and quite comical. The real Karl Marx may be rolling in his grave at the thought of wearing Margiela, but hey, he looks pretty good!